Sitting on a beach somewhere, enjoying the sun and the colorful local artists performing on the boardwalk, the Greek financial crisis may seem far away. Everyone studies the revered philosophers that came from ancient Greece, like Aristotle, Plato and Socrates. These days, however, the birthplace of Western civilization is just a small part of the modern global economy. Given a population of 10.8mm inhabitants, Greece's GDP is on par with the state of Missouri's. Greece's $242B GDP represents only 2% of the whole euro zone and 0.39% of the world economy. Strangely, the crisis happening in Greece is reminiscent of another predicament building in the commonwealth of US Territory, Puerto Rico. Puerto Rico's governor Alejandro Padilla has announced that the island's debt is simply not payable. Puerto Rico has borrowed a lot during the last 2 decades to compensate for a shrinking tax base, the migration of people to the US mainland and the departure of companies after the expiration of corporate tax breaks. The country couldn't pay its bills over that period and as a result, borrowed to repay older debts as well as running up new ones. The island is in a death spiral, says the governor. The cocktail of fresh borrowing and austerity measures didn't produce a balanced budget, but on the contrary, created bigger deficits. Today the island home of 3.6mm has declared $72B of debts, with roughly 33% of it belonging to public corporations like the Electric Power Authority and other utilities. 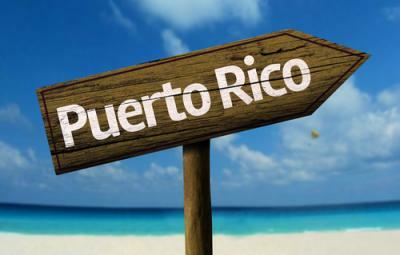 Puerto Rico owes a greater sum per capita than any US state and may very soon run out of cash. That grim financial landscape could have a big impact on bond holders. Many hedge funds and mutual funds have Puerto Rican bonds in their portfolios because of their tax free status in every state. Banks hold them as well. For a very long time, the island's political leaders swore they would reimburse the debt. The priority was to protect market access and potential borrowing if there was a gap in the budget. Consequently, general obligation bond repayment is guaranteed in the constitution of the commonwealth. Bonds have to be paid before any other expense, until they are not. The governor has done the math. He is asking concessions from all the creditors. He'd like to defer some payments for 5Ys, extend the time frame for repayments and lower payments. Creditors are obliged to share the pain, pleads the governor who would like to create debt exchanges. Puerto Rico would then replace current obligations with new bonds, more favorable to the island's economy. PR has also considered declaring bankruptcy for the public corporations. The Electric Power Authority and the Water Agency could erase $25B in debt with the stroke of a pen. The judge who oversaw Detroit's bankruptcy case is consulting with the governor, but right now as a commonwealth entity, Puerto Rico cannot avail itself of the US Federal bankruptcy law. It needs permission from the US Congress, and we know it can move slowly. The way Puerto Rico solves its crisis could affect the much greater $3.7T municipal market for states, towns and local governments in the mainland as well. Bond buyers were already scrutinizing Detroit's bankruptcy and now they must worry about the willingness of distressed local governments to repay debts. Some are asking whether Puerto Rico is the Greece of the Caribbean, but there is a big difference. The island of Puerto Rico is not eligible to seek help from the IMF, so all eyes are on Washington and the bankruptcy rules. Treasury yields dropped 4 to 6bps as retail sales numbers for June disappointed the markets. Net income of $6.3B (+5% YOY); net revenue (-3%); noninterest expense (-6% YOY). Other data of interest YTD: loan growth (+4.4%); FTEs (-1.6%); efficiency (59%); 37.9mm active online customers (+4.1%); 21.0mm active mobile customers (+10%); 5.504 branches (-1.7%). Other data: ROE (11%); ROA (1.01%); NIM (2.00%); LTD ratio (61%); loan loss allowance to loans (1.45%) and dividend payout ratio (28%). Net income was $5.7B (+0% YOY), net revenue (+1%). Other data of interest YTD: loan growth (+3%); FTEs (+1%); efficiency (59%); 26mm active online customers (NA); 16mm active mobile customers (NA). Other data: ROE (12.7%); ROA (1.33%); NIM (2.97%); LTD ratio (75%); loan loss allowance to loans (1.42%). Wells Fargo has redesigned its online business services (CEO Portal) to include: information reporting; fraud prevention; increased security; faster customer access to information and the ability to use smartphones, tablets or laptops. Wells is also piloting voice, face and eye vein biometrics for user authentication with a 2016 rollout date. A survey by Travelers of Us businesses finds the top risk concerns this year are: medical cost inflation (87%), cyber risks and data breaches (81%), increasing employee benefit costs (77%), legal liability (77%), regulatory compliance (71%), attracting and retaining talent (69%) and broad economic uncertainty (67%). A survey by Deloitte assessing global risk management practices in the financial services industry finds 92% of institutions have a chief risk officer (CRO) vs. 89% in 2012 and 65% in 2002. Further, 68% said the CRO reports to the CEO.